I took a walk around on Sunday after the rains had stopped for a bit. 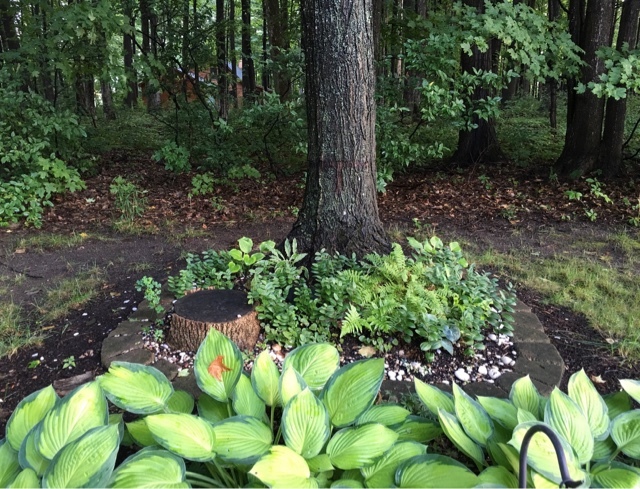 My original fairy garden location sits quietly. I am planning a different strategy next year and plan to put a little bit of fairy activity back out here. Grass barely grows out back. The trees compete for the moisture with their roots and the shade isn't favorable for grass- not even what they call "shade grass". 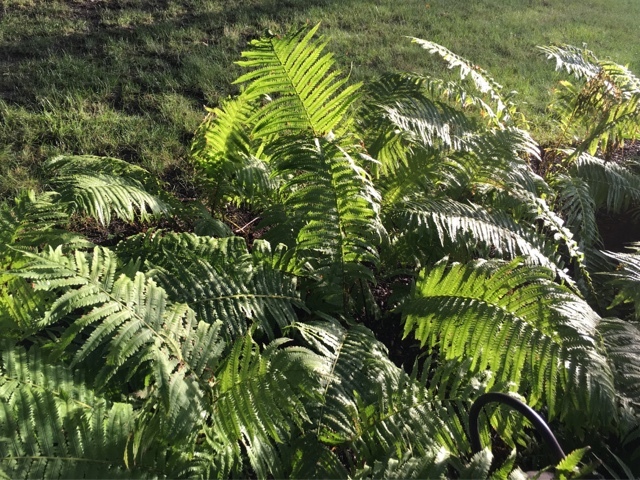 I turned and saw how the evening sun was highlighting the ferns so I snapped a shot. My big planter with the wire orb has reached it's peak. The planters out by the fountain were supposed to have yellow, red and white flowers. 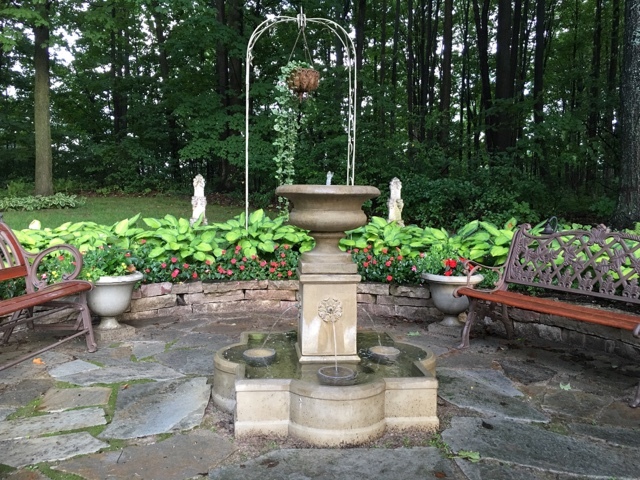 The yellow violas disappeared and the New Guinea impatiens have been fussy. New plans for next year once again. Things look messy after a rain yet the plants always look healthy and crisp in color. When you live by big trees there is always something coming down to the ground. We put in some flower pots that we added a screen to go make the sound of the water a little softer. The birds land on them and the screens fall in. We need a better design but it really works. This looks like a little park doesn't it. I didn't plan it that way but that's how it looks. I like to sit out here and relax for a bit. There is always a big difference in the temperature here than back at the house. 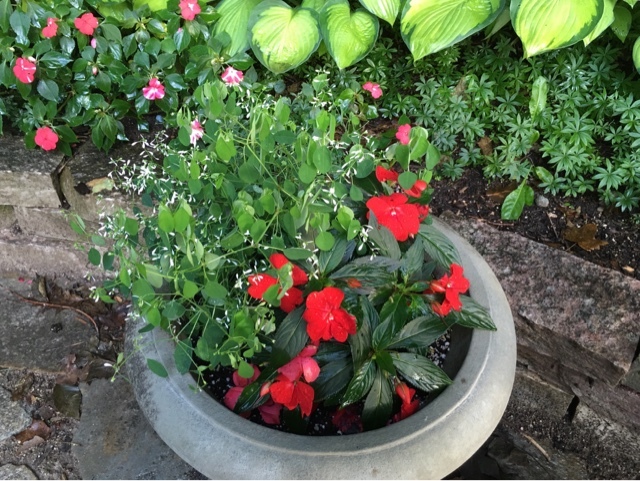 These impatiens have done okay but not my favorite choice. Perhaps I will consider a different approach for next year. 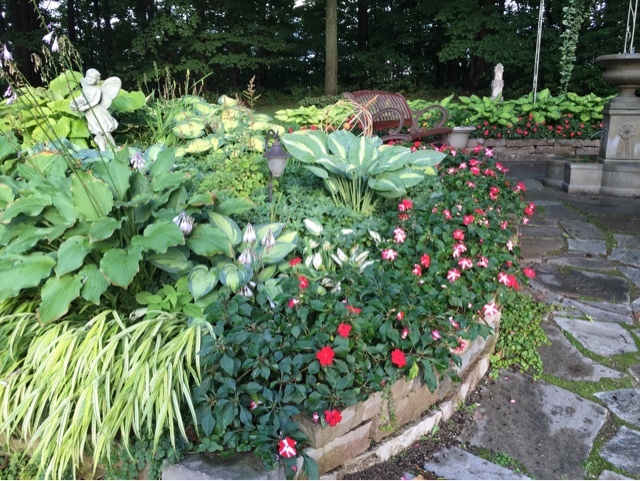 I have a lot of hostas and ground cover that can fill in where the annuals have been going. They're not as prone to drying out and needing that extra water as often either. We shall see. 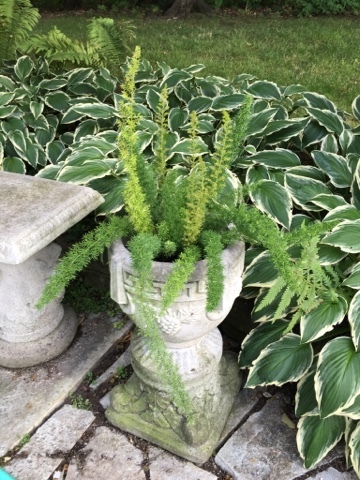 These fox tail ferns haven't done as well as in previous years They just kicked out a bunch of new growth. I used a different potting soil this year with composted cow manure- I think a bunch of these plants struggled with it. I'm always amazed when I pull them out. The whole thing is nothing but a big root ball and tough. I wish I had a way to keep things going in the house. I simply have no good area for plants. Looking back towards the house. 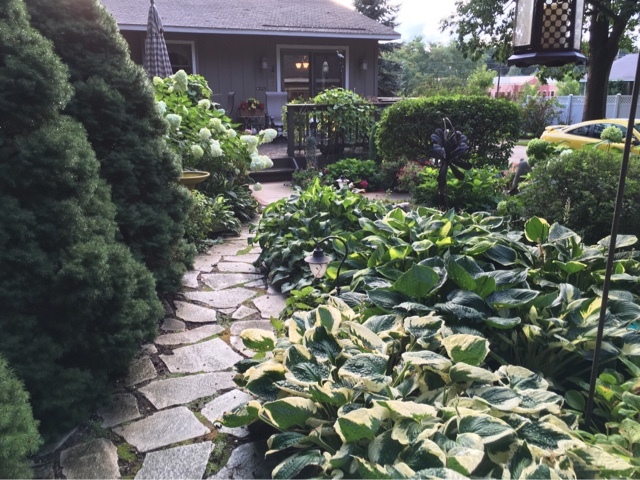 The hostas that are overlapping the walkway further down are under consideration to move. I like the gently overlapping affect of plants along the walkway but they've become too large. The old ash tree stump is steadily growing more fungus. 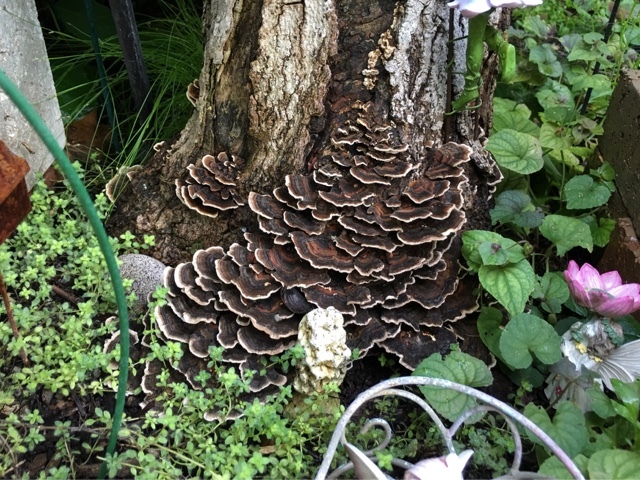 I looked it up and I believe it's called Turkey Tail Mushroom. I guess the conditions were especially good for it this year! The old wagon has turned out great this year. 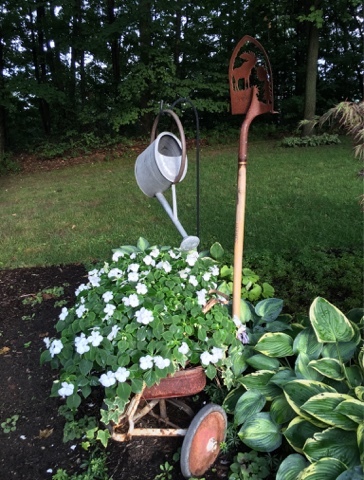 The wagon handle has nearly disappeared into the impatiens. Oh wait one more- I am in love with these pretty hydrangeas. 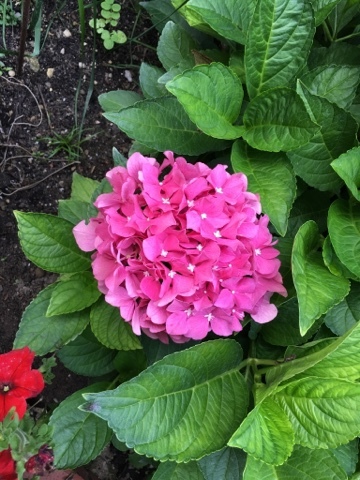 They have such a vibrant pink color and a star like white center. City line Paris- bigleaf hydrangea. 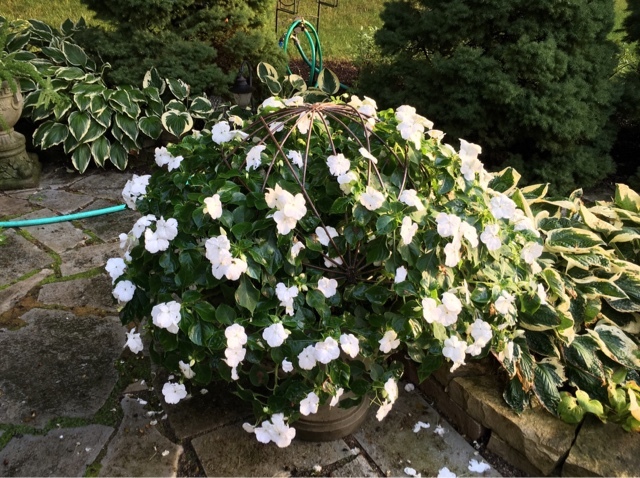 Hybrid dwarf from Germany- doesn't need pruning. As always think you for following and commenting! 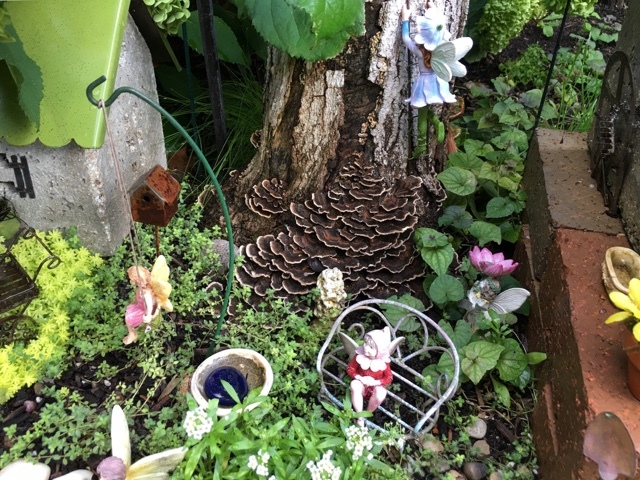 Interesting that Turkey Tail mushrooms, they look just wonderful in your fairy garden. I´m always impressed by your beautiful collection of Hostas and no slugs or snails....even not after the rain. What a lovely treat to see your late summer garden. Everything is lush and gorgeous. 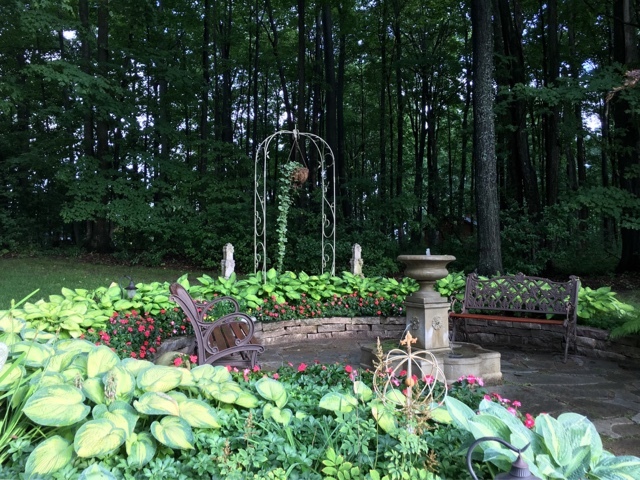 Your gardens really do look like a park! Have a wonderful week, Liz. I just love your garden. I don't think I would ever leave.